Arizona Public Service, Arizona’s largest utility, announced plans Thursday for a 280-megawatt solar power plant to be built 70 miles southwest of Phoenix by Spanish company Abengoa Solar. What’s striking about the deal is that it offers a rare glimpse inside the economics of Big Solar. And as the renewable energy industry pushes Congress to extend crucial green tax credits, the jobs that will be spawned by the Solana Generating Station and the economic ripple effect of the huge construction project is Exhibit A in why fighting global warming can be a win-win when it comes to the economy and the environment. All the previous contracts for 100+ megawatt solar power plants have been in California, where utilities PG&E (PCG), Southern California Edison (EIX) and San Diego Gas & Electric (SRE) have shrouded power purchase agreements in secrecy. APS (PNW), on the other hand, has lifted the green veil a bit, giving some indication of the current cost of producing utility-scale solar electricity and the larger economic impact. According to APS, the utility will pay around $4 billion over 30 years for the greenhouse gas-free electricity generated by Solana that will light 70,000 homes. That comes to about $133 million a year for the life of the power purchase agreement. Abengoa spokesman Peter Kelley told Green Wombat that the exact kilowatt per hour rate the company is paying APS is confidential. No doubt though that the utility will pay a premium per kilowatt/hour for its first large-scale solar energy deal compared to electricity produced by a coal or natural-gas fired power plant. That cost disparity is likely to evaporate when the United States moves to price carbon — either through a carbon tax (unlikely) or a cap-and-trade system that requires fossil-fuel power plants to pay if they exceed limits on CO2 emissions. And the cost of financing carbon-spewing power plants will grow in coming years as Wall Street shies way from projects that carry climate change risks. And as solar power plant components and systems go from being one-off prototypes to mass-produced commodities, the cost of solar electricity is expected to drop even further. Abengoa and APS are not revealing the construction cost of Solana but solar power plants of that size can run half a billion dollars or more. Of course, once built their operating costs are significantly lower than conventional power plants; the fuel — the sun — after all is free. In the meantime, the Solana Generation Station is expected to inject about $1 billion into the Arizona economy as Abengoa hired 1,500 workers to build the power station and 85 others to operate it, according to APS. The utility estimates that the ripple affect will create another 11,000 to 15,000 jobs. 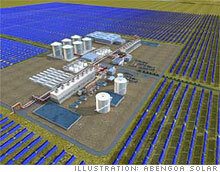 Abengoa is using a solar trough design for the plant. A tried and true technology, solar trough plants deploy long rows of parabolic mirrors to heat liquid-filled tubes to produce steam that drives electricity-generating turbines. The Solana plant will also store heat in silos of molten salt. The heat can be released when the sun is not shining to run the turbines. “The molten storage will extend the operating hours of the plant both during cloud cover and when sun goes down,” Kelley says. That means Solana can continue to generate electricty as long as six hours after sunset. Solana is likely to be just the first big solar power plant in Arizona. Utilities there must obtain 15 percent of their electricity from renewable sources by 2025 and with little wind or geothermal available in Arizona, the state is likely to place a big bet on Big Solar. on February 24, 2008 at 7:22 am | Reply HappyToSeeIt, SaintLouis, Mo. Finally. Solar technology is much more easy on the environment, is infinitely renewable, and *creates jobs here*. It is worth the up-front investment. We should have these quiet, effective power plants all over our american deserts. It would also bring in revenue for those states, and with plug-in hybrids, greatly reduce the money we send to terrorists. This tech is proven (since the 80’s), as seen in the Mohave desert. See http://www.solel.com. This is real. Now. Congress should try to be as $ supportive as possible. It is a good U.S. investment in ourselves. We can employ our own people and generate our own power. Cleanly. As I recall, sufficient solar energy pours down on the American southwest to drive our entire nation (many times over), if we display sufficient ingenuity anough to harness it. All we need is motivation. The cost of big projects are outta sight now. It is very unlikely that we will undertake any more big projects let alone highway construction like widening, etc. Look at Oakland Bay Bridge that had skyrocketed from less than a billin dollar to 6 billion primarily because former mayor SF Willie Brown made a big fuss about which side of island the new bridge should connect. You see, politics will wind things out.. Willie Brown wanted the bridge to be moved from going over a historic general’s home on the island. This alone might be responsible for an extra couple of billins of dollars due to inflation and political bickerings. Basically, Wille Brown was just trying to drain funds from Sacramento that are earmarked for other projects awaiting around San Francisco. San Francisco is squandering funds all for itself and want to keep commuters coming all congested up and too tired to work in San Francisco…. Businesses in San Francisco has less reason to relocate out of San Francisco since there is no improvement under plans outside San Francisco core area..
Carville’s Its the economy, stupid is reversed into It is the stupid economy, moron! Wall Street is an annex of Washington DC Beltway !! Gumby — you got it backwards. Washington is the annex of Wall Street. Main Street is just the servants’ quarters. HappyToSeeit – While I agree with you in principle, the major roadblock (at least conceptually) to replacing fossil fuel power with solar power in the U.S. is that in order to do so (using the most efficient technology available today) would require an array that would require landmass the size of Texas. I think the best solution is to decentralize power production and increase subsidies for private solar arrays to be installed on every home and business’s roofs in order to supplement the utility arrays. Of course this is assuming that there isn’t another major breakthrough in solar technology in the next few years, which of course would be a fool’s wager. So let’s see if I get this right – a 280 megawatt solar field will cost that area 4billion dollars over 30 years. From my reading on the web it costs about 2billion to produce a 1300 megawatt Nuclear Power Plant. So for half the cost you get nearly 5x more power output. Is it really wise to create another 11,000 to 15,000 jobs in the middle of a desert? Phoenix has already grown so big that I wonder if it is sustainable.